Matt Cutts, Google’s distinguished engineer, reported through his Twitter account that Google has updated its page layout algorithm. Google initially launched this search ranking tool in January, looking to penalize sites that placed excessive ads instead of user-focused content above the fold. 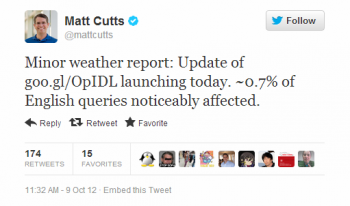 In his Tweet, Cutts reported that the update affected 0.7 percent of searches. While this represents a minor update, it impacts more queries than the most recent Penguin shift, which altered 0.3 percent of searches. Only English-language searches will be affected by the page layout algorithm. Even the first page layout algorithm had a relatively minor impact on the web, as it affected less than 1 percent of global searches. However, the algorithm is a reminder that site design should emphasize in-demand content and make valuable information easy to discover. More than anything, Google’s search algorithms look to reward sites offering visitors a seamless experience. Each update focuses on rewarding high-quality websites related to that answer in search queries. Despite constant changes in Google search, it’s important for SEO marketers to offer content and other site elements they believe will satisfy their website visitors. Brafton recently highlighted a series of updates from Google in recent weeks, including the latest versions of Panda and Penguin. Ultimately, a strategy aimed at delivering a quality user experience will win out over any efforts focused solely on algorithms.